Since starting my academic career, small wind turbine research work at The University of Newcastle has attracted over $500,000 in research income. In 2005 a colleague formed a company, Aerogenesis Australia, to commercialise the wind turbine technology developed by the group. This company has received $1.245m to commercialise the groups small wind turbine technology. The computational biomechanics research group has received significant publicity in the popular scientific literature and film including: " A segment on Catalyst ABC science program covering the jaw testing and palaeontology of the Marsupial Lion, Thylacoleo (Series 6 Episode 38 2005). " Dingo had measure of Tassie tiger article published in BBC News (online) reporting the finding of our paper which predicted the Tasmanian tiger to have more powerful bite but the dingo was better equipped to deal with struggling prey (September 2007). " Sabre-toothed cats were weak in the jaw article in Nature news reporting the findings of our paper into the popular science press (October 2007). " 'Crash-tested' skulls throw light on extinctions article in New Scientist about the groups finite element work on great white shark jaw (April 2008). " The work on the great white shark, documented in Wroe et al. (2008), has made the top 100 stories of 2008 in DISCOVER Science technology and the Future magazine. Small wind turbine dynamics and fatigue testing and issues related to small wind turbine blades Computational biomechanics: Creating, solving and interpreting the results of detailed finite element models of biological structures. Finite element analysis Mechanical Engineering design Computer Aided Eningeering. Head of Mechanical and Mechatronics Engineering Deputy Head of School of Engineering (academic). My research consists of work in two areas: small wind turbine dynamics, and computational biomechanics. The former is about undertaking research to bring the level of performance of small wind turbines up to that of their larger counterparts, and for the latter using traditional engineering computational tools to understand the forces that drive the evolution of skeletal morphology. My interest in small wind turbine research has steadily evolved from a focus on the fundamental issues of small wind turbine dynamics to a more specialised focus on lifespan issues of small wind turbine blades. My early research interests lay in understanding the dynamic forces acting on small wind turbine blades operating in a wide range of flow regimes. The results of this work have been used to determine the design of the composite structure of wind turbine blades; that is the amount, type and lay of the fibreglass matting within the blades load-carrying external shell. It has led to the development of an accelerated blade fatigue test program which is used to quantify the lifespan of the structure of small wind turbine blades. A practical outcome of this research is the design of a high efficiency light-weight blade for small wind turbines. This technology will help reduce the cost and improve the performance of small wind turbines leading to cheaper renewable energy technology. My research work in computational biomechanics began in 2005 with a multi-disciplinary group formed in 2006 consisting of an engineer (me), a biologist and two palaeontologists. As the only engineer and a foundation member in the group as well as the finite element expert, I drive the computational analysis work providing modelling solutions to biological mechanisms and the interpretation of the computational results. We can now create high resolution, detailed heterogeneous finite element models of biological structure within 2 hours. The group has to date undertaken a reverse engineering analysis of the iconic fossil sabre-toothed cat (Smilodon fatalis), an analysis of the biomechanical factors underlying the out-competing of the Tasmanian Tiger on mainland Australia by the dingo, modelling of bite force in Great White Sharks, an investigation of skull mechanics in Komodo dragons, and a re-evaluation of jaw mechanics in mammals. Organisation: TUNRA Description: During this time period I have undertaken over 10 consulting activities through TUNRA. Here I have undertaken detailed finite element modeling for a wide range of industries. The work undertaken generally requires skills which are not generally available in the engineering community. © 2015, Nature Publishing Group. All rights reserved. Spider orb-webs are the ultimate anti-ballistic devices, capable of dissipating the relatively massive kinetic energy of flying prey. Increased web size and prey stopping capacity have co-evolved in a number orb-web taxa, but the selective forces driving web size and performance increases are under debate. The rare, large prey hypothesis maintains that the energetic benefits of rare, very large prey are so much greater than the gains from smaller, more common prey that smaller prey are irrelevant for reproduction. Here, we integrate biophysical and ecological data and models to test a major prediction of the rare, large prey hypothesis, that selection should favour webs with increased stopping capacity and that large prey should comprise a significant proportion of prey stopped by a web. We find that larger webs indeed have a greater capacity to stop large prey. However, based on prey ecology, we also find that these large prey make up a tiny fraction of the total biomass (=energy) potentially captured. We conclude that large webs are adapted to stop more total biomass, and that the capacity to stop rare, but very large, prey is an incidental consequence of the longer radial silks that scale with web size. Finite element analysis (FEA) is a computational technique of growing popularity in the field of comparative biomechanics, and is an easily accessible platform for form-function analyses of biological structures. However, its rapid evolution in recent years from a novel approach to common practice demands some scrutiny in regards to the validity of results and the appropriateness of assumptions inherent in setting up simulations. Both validation and sensitivity analyses remain unexplored in many comparative analyses, and assumptions considered to be &apos;reasonable&apos; are often assumed to have little influence on the results and their interpretation. Here we report an extensive sensitivity analysis where high resolution finite element (FE) models of mandibles from seven species of crocodile were analysed under loads typical for comparative analysis: biting, shaking, and twisting. Simulations explored the effect on both the absolute response and the interspecies pattern of results to variations in commonly used input parameters. Our sensitivity analysis focuses on assumptions relating to the selection of material properties (heterogeneous or homogeneous), scaling (standardising volume, surface area, or length), tooth position (front, mid, or back tooth engagement), and linear load case (type of loading for each feeding type). Our findings show that in a comparative context, FE models are far less sensitive to the selection of material property values and scaling to either volume or surface area than they are to those assumptions relating to the functional aspects of the simulation, such as tooth position and linear load case. Results show a complex interaction between simulation assumptions, depending on the combination of assumptions and the overall shape of each specimen. Keeping assumptions consistent between models in an analysis does not ensure that results can be generalised beyond the specific set of assumptions used. Logically, different comparative datasets would also be sensitive to identical simulation assumptions; hence, modelling assumptions should undergo rigorous selection. The accuracy of input data is paramount, and simulations should focus on taking biological context into account. Ideally, validation of simulations should be addressed; however, where validation is impossible or unfeasible, sensitivity analyses should be performed to identify which assumptions have the greatest influence upon the results. © 2013 Walmsleyet al. This paper presents and discusses the results of detailed strain gauge measurements taken from the surface of a composite blade on a small horizontal-axis wind turbine. We believe that these are the first such measurements to be taken on a small wind turbine. The two-bladed upwind machine is located adjacent to Fort Scratchley, a historic seaside landmark in Newcastle, and has a nominal rated output of 5 kW at a wind and rotor speed of 10 m/s and 400 RPM respectively. A series of field experiments were undertaken where the aeroelastic response of the blade was measured with 26 surface mounted strain gauges, along with the wind speed and direction, turbine speed and direction and turbine power output. The results show a periodic fluctuation in both the blade flapping and lead-lag directions with a once per revolution period. The measurements presented in this paper form part of a joint computational and experimental investigation of axisymmetric diffuser flow. The major aim of this program is to develop a computational model for use in optimising diffuser performance by avoiding both separation and recirculation. The inlet swirl was close to solid body rotation. Axial and circumferential velocity measurements at the outlet showed large changes over the 1.7:1 range of inlet swirl levels. Detailed boundary layer measurements were made for a swirl level that avoided both boundary layer separation and recirculation in the core. The boundary layer appears to be dominated by the axial pressure gradient and mean streamline curvature. The turbulence structure was still responding to the perturbations at the last measurement station, thirty boundary layer thicknesses from the inlet. This paper discusses the intepretation of X-probe measurements obtained in the wake of a model wind turbine using the technique of phase-locked averaging. To measure the three mean velocity components, the X-probe was used in two planes, giving a redundant estimate of the component along the probe axis. The correction of the measured mean velocities for the effects of transverse velocities is described and justified. The corrections reduced the axial component by up to 20%, while the components orthogonal to the probe axis were hardly altered. These results show that the need for transverse velocity corrections can be assessed easily by comparing the two uncorrected estimates of the axial component. Similarly, the comparison of the two corrected axial velocity measurements, can indicate the adequacy of the correction. Phase locked averaged measurements were obtained behind a model wind turbine to determine the velocity field relative the rotating blades. The accuracy of the phase locked results was found to be excellent. An equation for the turbine power as a function of the average, phase dependent, and turbulent components is derived. The phase dependent and turbulent components are due mainly to viscous effects in the blade wake. Flow nonuniformities with a slight difference between the blades of greater significance than these viscous effects. 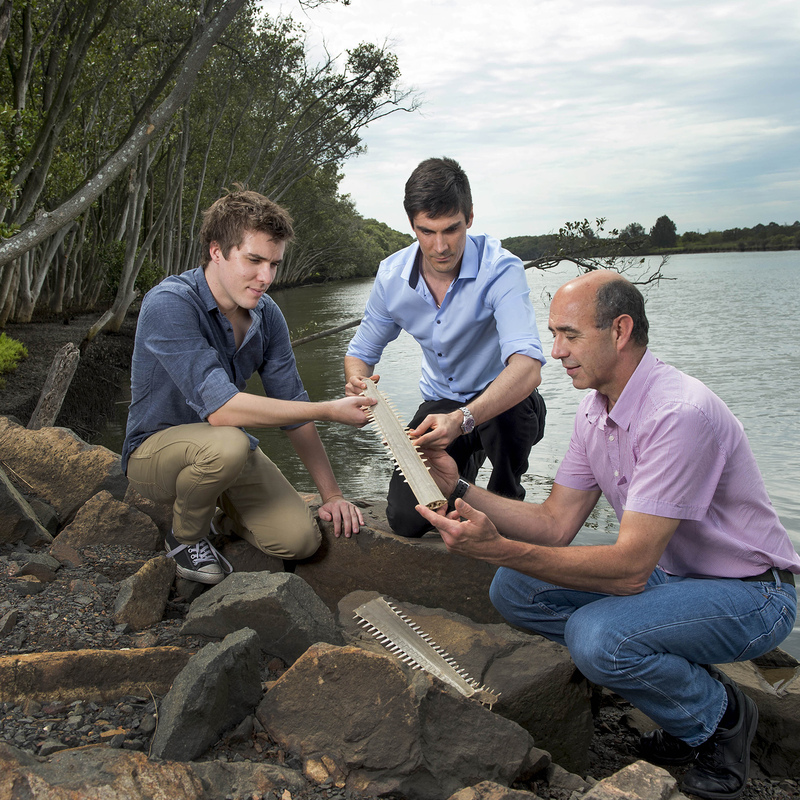 UON research findings likely to have a significant impact on the future survival of the critically endangered sawfish.